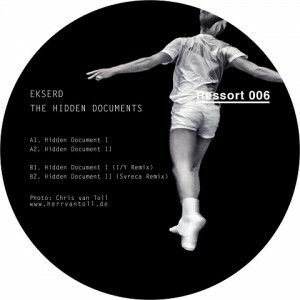 The word ‘trance’ comes over my lips when listening to four hidden documents, released by Berlin’s fledgling Ressort Imprint. Of Ekserd’s original material, the opener “Hidden Document I” behaves wildly when boosting blood pressure with rough drum driven material. Next, I can’t ignore the feeling of hearing a Kangding Ray track when “II” opens the door for dubby screeches and trancy elements already heard in the opener. The B-side is dedicated to the reworks of visiting artists. Firstly, I/Y’s drops a high altitude version, before Svreca takes “II” to a trippy flight, for me the highlight of the release. To mention is also the digital bonus “Wons”, Ekserd’s co-op with Array Access, representing soft-spoken electronica. An EP that will find friends on the floor.